Abigail "Abbie" Eaton (born 2 January 1992) is a racing driver from the East Riding of Yorkshire, England. She stars as the test driver for the second and third series of The Grand Tour. Eaton is a qualified racing instructor, and when not racing, works as a performance driving coach. Eaton lives in Northampton, England, along with her pets. Her father, Paul Eaton, is also a racing driver. Following accusations of homophobia directed at The Grand Tour cast and crew, Eaton came out as gay via Twitter. Abigail "Abbie" Eaton (born 2 January 1992) is a racing driver from the East Riding of Yorkshire, England. She stars as the test driver for the second and third series of The Grand Tour. Eaton is a qualified racing instructor, and when not racing, works as a performance driving coach. Eaton lives in Northampton, England, along with her pets. Her father, Paul Eaton, is also a racing driver. Following accusations of homophobia directed at The Grand Tour cast and crew, Eaton came out as gay via Twitter. Eaton began motor racing at the age of ten. Eaton set lap records in different racing series. Aged ten years old Eaton started karting in the Comer cadet class, gaining invaluable track craft along with numerous podiums and wins. She then resumed kart racing for three more years, moving up into Minimax and then Junior Max, competing in the Super 1 series. In 2007, Eaton completed her first season racing cars, in the SAXMAX Championship at various tracks around the United Kingdom with a highest position of fourth place. In 2008, Eaton returned to the SAXMAX championship and led for most of the year but ended in fourth place, with three podiums and two fastest laps. In 2009, Eaton moved into her first year of adult car racing in the Production Touring Car Championship, driving a Vauxhall Corsa SRi-R. She won the class B championship outright with 15/18 wins, sixteen podium positions, and seven fastest laps, finishing second overall in the championship. In 2010, Eaton was without a team when her British GT debut fell through a few weeks before the season was due to start. However, she did manage to make one race in the Mazda MX-5 Mk1 championship, finishing third out of over 90 entries. In 2011, Eaton raced a rear-wheel Mazda MX-5 Cup car. After a tough season missing several rounds due to a lack of budget, Eaton managed to achieve eleven top-ten finishes and a highest qualifying coming third. Eaton competed in a handful of races in the 2012 Mazda MX-5 Cup, but had to withdraw owing to family circumstances. In 2013, Eaton raced in the last three races of the Mazda MX-5 SuperCup with a win, two second places, one third and one fourth. She also raced in the Autumn Challenge and achieved two second places. In 2014, Eaton returned to the British Racing and Sports Car Club (BRSCC) Mazda MX-5 Supercup Championship for the last time. Despite car troubles early in the season, Eaton went on to achieve five wins, seven podium finishes, six fastest laps, two pole positions, and a new lap record. She was crowned the 2014 Mazda MX-5 Supercup Champion. During a race at the Anglesey Circuit, she qualified on pole position eight-tenths of a second ahead of second placed position, and went on to win, set the fastest lap, and then set a new lap record, all within three races. Eaton entered GT Racing via the UK based championship GT Cup. She competed for part of season in a BMW E46 M3 GTR run by Geoff Steel Racing. Eaton achieved one win, eight podium finishes, and three fastest laps. In 2016, Eaton moved to the British GT Championship in a Maserati Granturismo MC GT4, the first time that Maserati had been in the British GT for over 20 years. She shared driving duties with Marcus Hoggarth, and their team placed second in the Pro/Am Championship and fourth overall. In 2017, Eaton began with a year out, and was then offered a one off drive for the 2017 Blancpain GT Series in a Ferrari 488 GT3 run by AF Corse. This was Eaton's first time in a GT3 specification car and first time at the Autodromo Nazionale Monza circuit in Italy. Following ten laps of practice, Eaton entered the race as one of the 52 cars starting, and finished in first position in the Am cup, making her the first female ever to win a class in the series. The car was number 961, driven by Eaton, Alex Demirdjian, and Davide Rizzo. Eaton appeared on ITV's Drive in 2015, coaching rapper Professor Green in various racing car challenges over a five-week period. This included mud buggy, stock car, and sports car races. Eaton and Professor Green were the most successful pairing, staying out of the eliminator night race and making it through to the final round. Eaton and Professor Green were crowned champions in the last episode. Eaton also stars as the test driver for the second and third series of the British motoring show The Grand Tour, replacing the previous first series test driver Mike Skinner. James May stated in November 2017 that a large number of drivers had been tested, and that "she was the fastest and the best". Eaton was later introduced to the show in the second episode of the second series, on 15 December 2017, when she was shown testing a green Mercedes-AMG GT R around the Eboladrome test track. In the Mercedes, Eaton says "Right, here we go" to herself, before starting the lap and completing the test drive silently. Eaton did not have her name mentioned at all throughout the episode, only being referred to as "she", and her name was only shown in the credits at the end of the episode, credited as "driver". Motor1.com speculated that The Grand Tour would likely be under legal restrictions, and needing to provide differentiation between The Grand Tour test driver and anonymous drivers such as the Stig. A spokesperson for Amazon suggested to Jalopnik of a compromise between the explicitly named "the American" test driver portrayed by Skinner, and being unable to use a completely anonymous driver like on Top Gear. During the first episode of the third series, Jeremy Clarkson referred to her simply as, "Abbie", suggesting that Amazon may have finally made a decision in this matter. During the fifth episode of the third season, Clarkson presents her at the beginning of a race by noting that the car "is being driven by The Grand Tour's racing driver, Abbie Eaton." In April 2018, Eaton was interviewed by Red Bull about her work on The Grand Tour. 1 2 Pedrosa, Patrícia (2017-12-15). "Who is the new The Grand Tour driver?". DriveTribe. Retrieved 2017-12-15. ↑ "Abigail Eaton". Instructors. Association of Racing Driver Schools. Retrieved 15 December 2017. ↑ Cooke, Phoebe (15 December 2017). "Who is Abbie Eaton, new Grand Tour season two racing driver replacing Mike Skinner?". The Sun. Retrieved 15 December 2017. Abbie lives in Northampton, where she has a dog (Tilly) and cat (Marmie). ↑ "The Grand Tour 'Homophobic' Jokes From Colombia Special Sparks LOTS Of Anger". Grand Tour Nation. 30 January 2019. Retrieved 31 January 2019. ↑ Eaton, Abbie (2019-01-30). "It's so homophobic they've even got a gay as their driver..." @AbbieEaton44. Retrieved 2019-01-31 – via Twitter. ↑ Kundu, Asmita (17 December 2017). "Ladies and gentlemen, the Grand Tour's new American is this 25-year-old British female racing driver". International Business Times. Retrieved 18 December 2017. She started her career in this field at the age of 10. ↑ Khan, Basir (16 December 2017). "The Grand Tour Has Found Its New Driver". /Drive. Retrieved 18 December 2017. Abbie Eaton … is the 2014 Mazda MX-5 Supercup Champion and, like the show's hosts, is British. The 25-year-old has an incredible record of podium finishes and lap records across multiple racing series. ↑ "Abbie Eaton at Driver Database". Retrieved 2011-05-26. ↑ "Abbie Eaton - Official Site of British GT Championship". www.britishgt.com. Retrieved 16 December 2017. ↑ "Ebor GT's new Maserati finishes eighth on British GT Championships debut at Brands Hatch". York Press. Retrieved 16 December 2017. 1 2 "Lamborghini wins Monza 3 Hour". Speedcafe. 24 April 2017. Retrieved 18 December 2017. Winner of the Pro-Am Cup and eighth overall went the way of Ahmad Al Harthy and Jonny Adam aboard an Aston Martin. In the Am category Abigail Eaton, Alex Demirdjian and Davide Rizzo took honours in a Ferrari 488. ↑ Aleš Sleeper Dragoun. "The Grand Tour má novou testovací jezdkyni. Kdo je Abbie Eaton?" [The Grand Tour has a new test rider. Who is Abbie Eaton?]. Auto.cz (in Czech). Spolu s Alexem Demirdjianen a Davidem Rizzem se střídali za volantem Ferrari 488 GT3 slavné stáje AF Corse. Vyhráli třídu amatérů, celkově dojeli na 27. místě. Žádná žena v tomto vytrvalostním šampionátu ještě neslavila, ani nezískala pódium, to zároveň znamená její prozatím nejvýznamnější zářez do statistik mimo rodnou zemi. ↑ Karanja, Earl (24 April 2017). "Round 1 of the Blancpain GT Series Endurance Cup which took place this past weekend at the Autodromo Nazionale di Monza". Retrieved 18 December 2017. AF Corse celebrated victory again in the Am Cup thanks to Abigail Eaton, Alex Demirdjian and Davide Rizzo in the #961 Ferrari 488 GT3. ↑ Pritchard, Tom (15 December 2017). "Who Replaced The American as The Grand Tour's Resident Racing Driver?". Gizmodo. Retrieved 15 December 2017. Abbie Eaton, who like Clarkson is from Yorkshire … she's from Hull. … she appareaed [sic] on ITV's Drive in 2015, coaching rapper Professor Green in a variety of racing challenges over the course of five weeks - with both eventually winning the series. ↑ O'Malley, James (15 December 2017). "The Grand Tour S2E2: A Much Better Job Of Faking Authenticity". Gizmodo. Retrieved 15 December 2017. new driver to take cars around the "Eboladrome" track - professional racing driver Abbie Eaton. ↑ Power, Ed (15 December 2017). "The Grand Tour, season 2, episode 2, review: Clarkson and co fail to step up a gear in trip to America". Daily Telegraph. Retrieved 15 December 2017. new "Stig"? … "The American" has been sent packing … the new test-driver taking on the Eboladrome is … a woman and negotiates the circuit at an impressive clip. ↑ McKellar, Sean (30 November 2017). "James May: Jeremy Clarkson is 'rather womanly'". Motoringbox. Retrieved 15 December 2017. May also went on … after suggesting that The Grand Tour's new racing driver is female. "We tested loads of people and she was the fastest and the best and that's how it should be," he said. "To employ her for any other reason would be patronising." ↑ Starkey, Adam (16 December 2017). "The Grand Tour season 2: Fans call out show for failing to mention new female driver's name". Metro. London. Retrieved 18 December 2017. Clarkson stated the team had tested out "former F1 drivers, rally drivers, stunt drivers, test drivers" until they found the fastest, before cutting to Eaton tearing up the track after a "And here she is…"
1 2 McAssey, Pat (18 December 2017). "The Grand Tour Doing More For Gender Equality In Motorsport Than FIA". New England Sports Network. Retrieved 18 December 2017. The Grand Tour finally broke out Eaton for episode two, … set a time in the Mercedes-AMG GT R around the Eboladrome. … Due to lots of legal mumbo jumbo, however, the trio couldn't create another faceless racer … As a result, Eaton is named in the credits, but not the program itself. ↑ Lazarus, Susanna (16 December 2017). ""Say her name!" Jeremy Clarkson introduces The Grand Tour's new female driver – but fails to identify her". Radio Times. Retrieved 18 December 2017. "And here she is…" teased Clarkson before showing footage of Eaton tearing up the track. ↑ Alexander, Susannah (17 December 2017). "The Grand Tour has a brand new driver – and fans couldn't be happier". Digital Spy. Retrieved 18 December 2017. clip then cuts to Eaton suited up in a car, saying: "Right, here we go." 1 2 Lee, Kristen (15 December 2017). "Abbie Eaton Is The Grand Tour's New Racing Driver But Bizarrely Nobody Is Saying Her Name". Jalopnik. Retrieved 18 December 2017. gone to a woman for season two. … Abbie Eaton, … omission of her name was actually so glaring that it distracted … only during the credits … spokesperson speaking on behalf of Amazon speculated … producers decided to downplay the role of the driver from a character to merely a driver … couldn't use an anonymous driver like the other car show does, so this is what we ended up with. ↑ Smith, Christopher (15 December 2017). "The Grand Tour Reveals New Racing Driver In Not-So-Grand Fashion". Motor1.com. Retrieved 18 December 2017. The way she was introduced on the show – or rather, not introduced … If The Grand Tour is still facing legal repercussions by featuring a Stig-like persona … a woman filling the racing shoes would be about as anti-Stig as one can get. But that doesn't explain the no-intro introduction and constant "she" references during the timed lap. The whole thing was extremely awkward, and that's putting it mildly. ↑ Stuart, Greg (6 April 2018). "How British racer Abbie Eaton became The Grand Tour's test driver". Red Bull. Retrieved 11 April 2018. Eaton, Abbie (18 February 2014). "Quick Questions for a quick driver". Girlracer (Interview). Interviewed by Marc Waller. Retrieved 15 December 2017. Eaton, Abbie (16 February 2015). 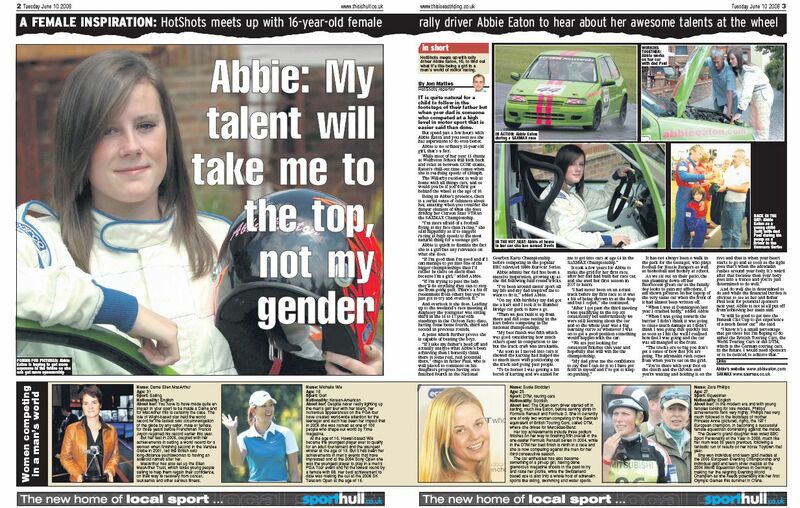 "Abbie Eaton, Racing Driver". Mazda Real Challengers (Interview). Series 2. Interviewed by Richard Parks. Retrieved 15 December 2017 – via Youtube. Eaton, Abbie (29 April 2016). "Abbie Eaton talks about GT's and TV". Girlracer (Interview). Interviewed by Marc Waller. Retrieved 18 December 2017. Eaton, Abbie (28 March 2017). "Abbie Eaton in the Comfy Chair". BBC Radio Humberside (Interview). Interviewed by Andy Comfort. BBC Online. Retrieved 15 December 2017. Eaton, Abbie (21 April 2017). "Abbie Eaton Interview". Junior Torque (Interview). Interviewed by Michelle Beverley-Jones. Retrieved 15 December 2017. Wikimedia Commons has media related to Abbie Eaton.